I have had this vintage ice cream chair for at least fifteen years. I painted the iron with Rustoleum Heirloom White a long time ago. The chair had been in my den until recently when I tried to sell it at an occasional crafts/collectibles shop on consignment. Luckily. it didn't sell, and I brought it back home. 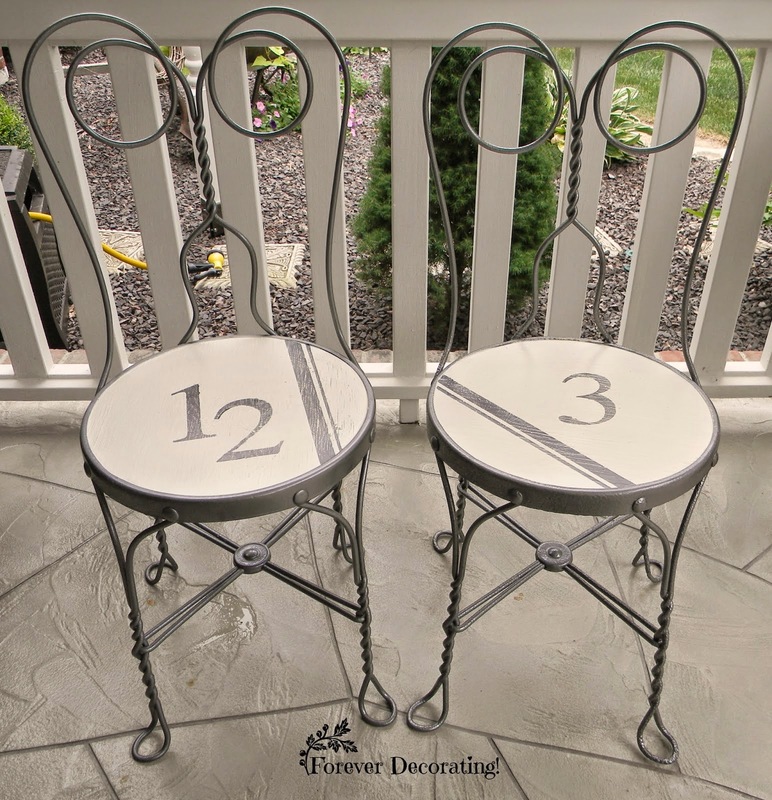 When I saw these ice cream chairs on Pinterest upcycled by Terry of Forever Decorating, I was inspired to transform my ice cream chair. Don't you love Terry's chairs? First, I painted my chair with a brush and Annie Sloane Chalk paint in French Linen on the legs, and Old White on the seat and back. Then I used blue painter's tape to make a stripe for stenciling and taped on a number "5" stencil. I used a round sponge stencil brush to add the French Linen stripe and number. I added a second thinner stripe when the thicker one was dry, and I filled in the part of the number that was blocked by the stencil. So where am I going to put my ice cream chair? (that I almost sold) In my vintage bathroom. The chair will be situated under my bathroom vanity. More of the bathroom changes to come! How cute! I love those old ice cream chairs. You made yours so personal for you. Great job... :-) So cute! Love this makeover! Aren't you glad it didn't sell? Thanks Carlene for sharing at VIP.